From the start, we knew we wanted to build an oversized watch. The design of HERCULES is influenced by one of the largest airships to ever fly – Howard Hughes’s H4 Hercules. A plane so long that it rivals the length of an Airbus A380. It’s wingspan longer than a football field. Higher than a 2 storey building where it wings can clear it with relative ease. It was in 1947 that this engineering behemoth was built. Yet, it is built almost entirely from wood – a relatively simple material. This is what HERCULES envisioned to be – HUGE yet simple. 50mm. That’s the size of the watch. It’s massive. It’s like wearing the bowl of the tablespoon on your wrist. However in the watch market, big usually means ugly or uncomfortable to wear or expensive. HERCULES is built to address these issues for oversized watches. Why is HERCULES so big? Initially, she is primarily aimed at people with big wrists. They have problems finding big yet simple watches to wear. But as time moved on, we found out that there were lots of people who like big watches but most of the oversized watches in the market are just downright not nice to even look at. HERCULES design philosophy employs minimalism – where more with less. Hence the clean white dial of the watch. But we never wanted to settle for simplicity only. We wanted to watch to do more than just being “simplistic”. So we made the whole white portion of the watch to be covered in luminous material. So when it the dark, the dial glows to a beautiful blue. HERCULES watch case may be big but it’s not made to be uncomfortable. Its caseback is designed to be flat. It is curved at its end and built to be a bit higher than a normal case. Giving it an idea of being “lifted”. With that being said, the case was maintained at a normal height of 13mm with a slight space in-between the edge of the case and your skin. The space is just big enough to not allow it to dig into your skin and just small enough to make it unnoticeable. 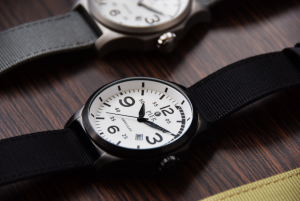 The watch is carefully paired with this selected textile watch strap which is soft enough to wear for long periods of time yet hard enough to withstand daily abuse. 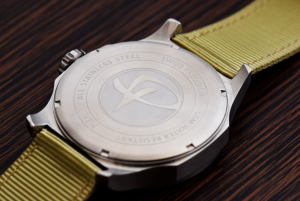 We have also specifically matched the buckle of the watch to the colour of the watch case. As they say, the devil is in the details. 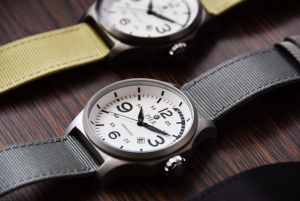 Based in Singapore, Pier watches is the brainchild of Edwin and Michael. Even though this is their first project in Kickstarter, They are no strangers to business. They have been dealing internationally for more than 5 years and have also ran similar startup projects but just not in Kickstarter. Strangely enough, the idea of HERCULES came out before they thought of the brand name. Pier watches end goal does not end with HERCULES. They do not want their timepieces to be just affordable. They want it to be beautiful. They want it to set you apart from other people. So they plan to be here for decades and be a watch manufacturing giant in years to come. In the end, they do realize that it will not be easy and it will never ever be easy to meet their end vision. Great for a quick shower, light rain or just dancing in the rain. Glows to a blue when in the dark. Be your brightest of light in the darkest of night. 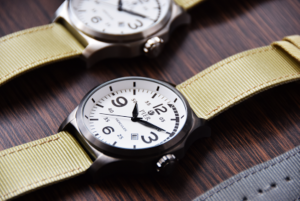 Carefully selected textile straps and buckle colours to match your watch case finishes. Durable construction and built to last for a lifetime.